Leslie Morissette of Springvale, who founded a nonprofit that provides technology to families and their children fighting serious illness, takes home $10,000. 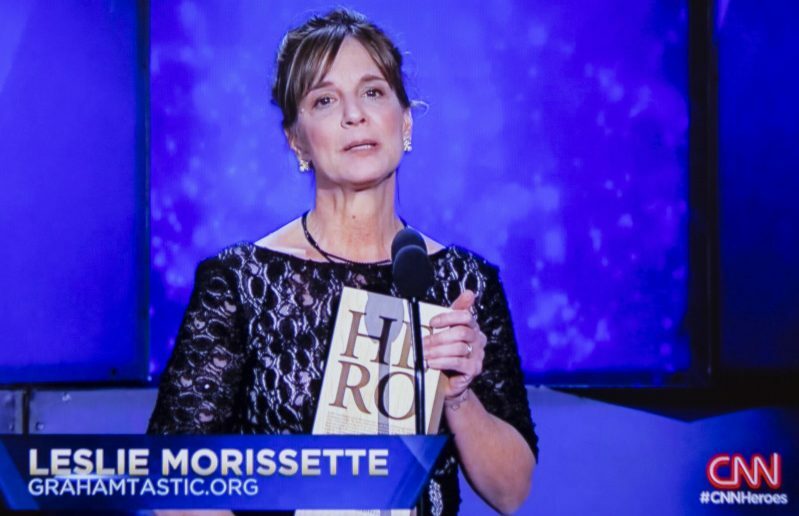 A Maine woman fell short Sunday night of being named CNN’s Hero of the Year for 2017 and winning the $100,000 prize that goes with it, but she can still count herself as being recognized as one of the world’s most generous people. Leslie Morissette of Springvale was chosen as one of 10 finalists by the cable news network for her work as founder of Grahamtastic Connection, a nonprofit organization she established after her 8-year-old son died of leukemia 20 years ago. The winner of the grand prize was Amy Wright, a mother of two children with Down syndrome who runs a coffee shop in North Carolina that employs 40 people with intellectual and developmental disabilities. In her introductory remarks, Wright vowed to change society’s perception of people with disabilities. “My employees are not broken, 200 million people across the world living with an intellectual or developmental disability are not broken. What is broken is the lens through which we view people with disabilities,” Wright said in her acceptance speech. The CNN award ceremony, which was hosted by Kelly Ripa and Anderson Cooper, was held in New York City at the American Museum of Natural History. Grahamtastic Connection was founded in honor of Morissette’s son, Graham, who died on Christmas Eve in 1997 just two years after being diagnosed with cancer. Her foundation provides modern technology – such as free laptops, robots and internet access – to families and their children fighting cancer and other serious illnesses. The devices allow sick children to continue their education, despite being unable to attend class with their peers. The organization has a fleet of 17 robots, which children can control from their home or hospital room. The robots are maintained by students from the Sanford Regional Technical Center. Morissette traveled this weekend to the CNN awards ceremony in New York with Philip Lippolis, an 11-year-old from Walpole, Massachusetts, who has been battling cancer since he was 6 years old. Lippolis needs a bone marrow transplant. Lippolis uses a mobile robot provided by Grahamtastic Connection that has a two-way iPad display screen mounted on its head. The robot travels on its own power, up and down school hallways, into classrooms and into the school cafeteria. It allows Lippolis to interact with his classmates as well as participate in classroom learning activities. “This one is for you my son, Graham. I love you,” Morissette said. After her remarks, Cooper asked Lippolis to stand up and be recognized. When he did, the audience gave the boy a standing ovation. “We are so glad you are here,” Cooper said. CNN chose 10 finalists from around the world. Each finalist will receive $10,000. The finalists included an Iraq War veteran who teaches surfing to veterans; a man who collects used soap and sanitizes it before distributing it to needy families in Cambodia; and a woman who provides a place for AIDs orphans to live in Capetown, South Africa. During her acceptance speech, Wright looked at the camera and addressed her children, who she said were watching. “I would not change you for the world, but I will change the world for you,” Wright said. In its 11th year, “CNN Heroes: An All-Star Tribute,” has profiled more than 300 heroes and received nearly 85,000 nominations from 100 countries. Popular voting for the CNN Hero of the Year closed Dec. 12, with votes cast using email, Facebook and Facebook messenger.